I started a new project a few days ago. 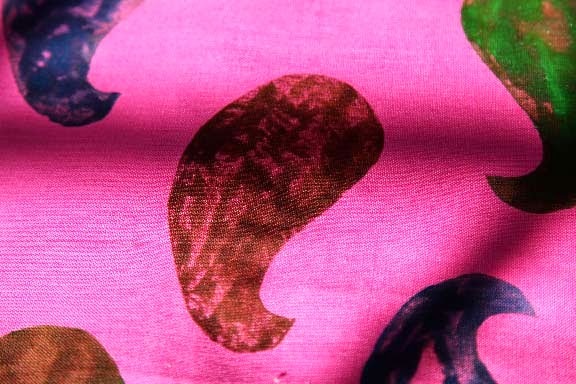 I have been thinking about combining fabric printing with embroidery for a very long time. Finally, my decks were cleared and I made time to begin. 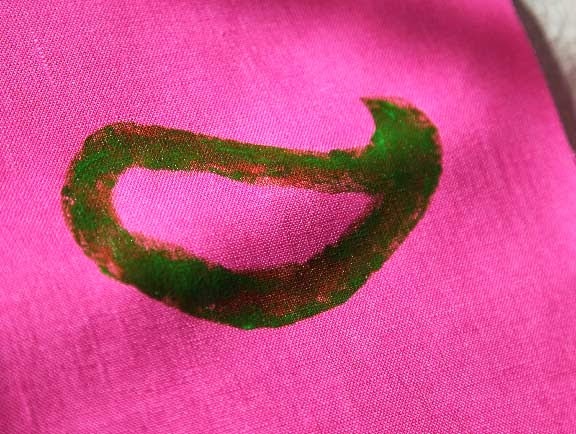 I began with fucshia linen that I sell on my website. I think I chose the fuchsia because I am so craving some color after this very long cold, white, and gray winter. 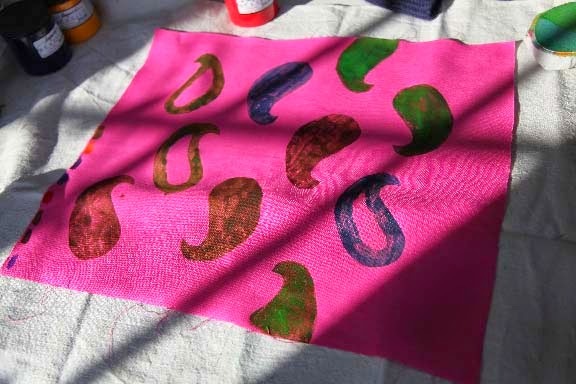 I ironed the rectangle and then tested some colors of Jacquard fabric paint I used for the linen dishtowel project in my new book Crafting A Colorful Home. 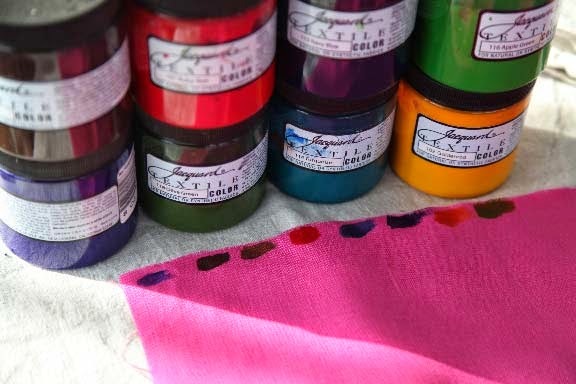 When you are printing on a colored fabric using these semi-transparent fabric paints, testing each color on a small scrap will give a preview of how each color will look on the dyed fabric. You only have to put a smidge on the fabric. 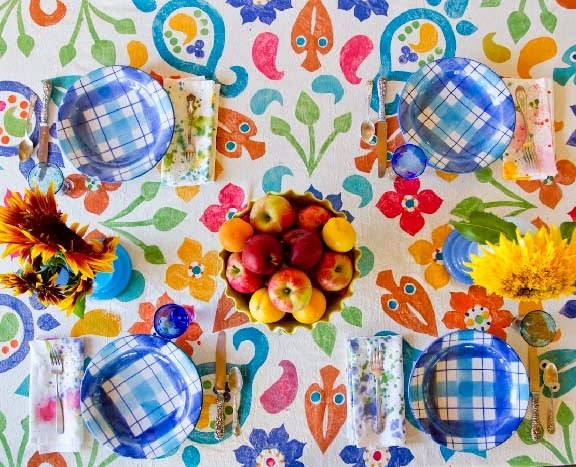 Once I narrowed down the colors I would use, I pulled my fabric printing stamps that I also used in Crafting a Colorful Home for this tablecloth project. I chose 2 smallish paisley stamps. Using a foam brush I splodged the paint on the printing blocks. In the photo below, you can see that you can place the colors on only one section of the block or on the entire block. Then I started printing using 3 different colors. Here is how the first paisley printed. As you can see, the printing is a bit uneven. 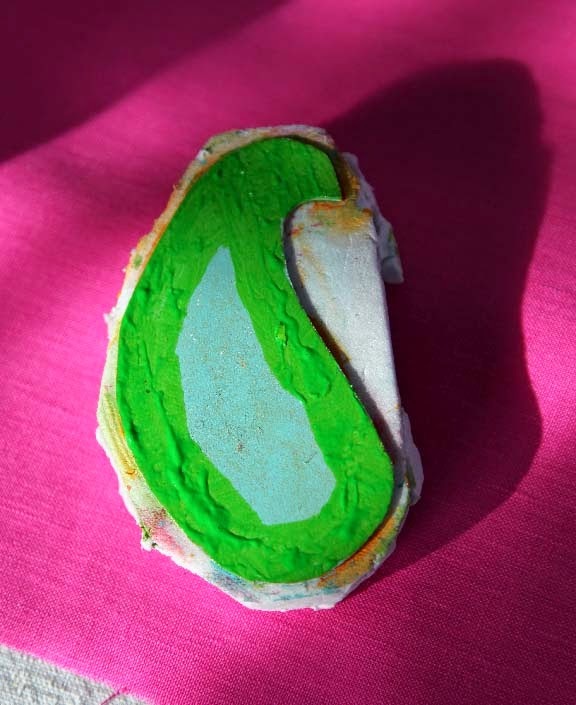 Partly that is because my paints are old and have some thick bits. But I like the look or the uneveness. Here is how the piece looked when done. Here is a close-up. 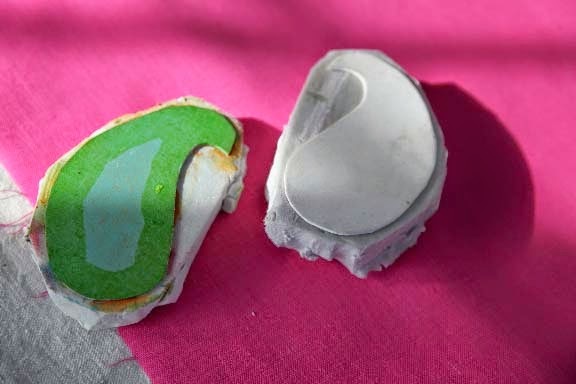 After printing, I heat-set the paint following the manufacturer's directions. Next up was beginning the embroidery. I edged each paisley shape in a contrasting color using the Crewel Wool (also available on my website here). Here is the close-up of the chain stitch. 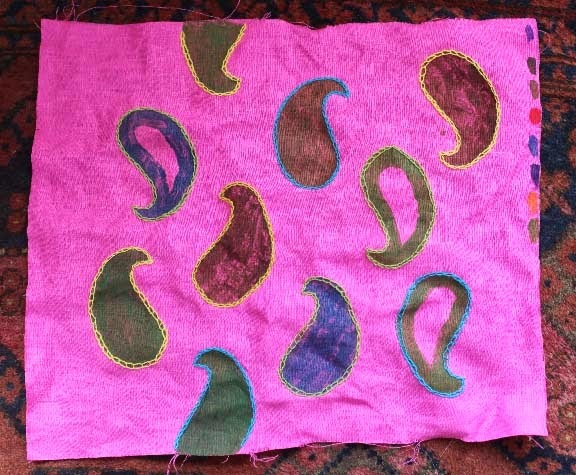 My plan is to use many different stitches and decorate each paisley differently. I'll take photos as I go and post them here. Embroidery is gaining in popularity. Here is an article on The Washington Post website written by the Associated Press. I really hope more and more people pick it up because it is so much fun and offers all kinds of artistic possibilities. 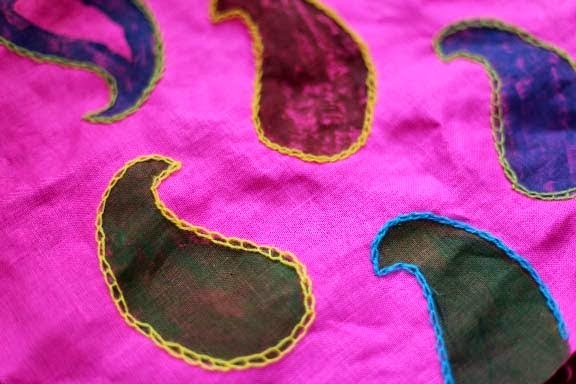 You can learn via my Craftsy Crewel Embroidery Class - Stitch It With Wool. There is a link on my sidebar to purchase the class for $19.99 (regular price $34.99). Maybe you will give it a try. Hope to see some of you at the Roslindale Library on Thursday evening for the speech I am giving. Fingers crossed the snow stays away. Love this! I wish I had more time to do all the crafts. Honestly, I haven't crewelled in 20 years... Crocheting and knitting have been occupying my time throughout "this" Century!Although, I do have *tons* of "supplies"! - [mostly yard sale thrift store finds] - Between the YARN and fabrics, I could probably start my own store! BUT, I just *LOVE* my STUFF too d*mn MUCH!! -- I refer to my totally FILLED "hoard"-room as "STORAGE WARS: Valley of the Kings, B.C." [before Carter]! It started snowing here late this afternoon [WHILE I was at the thrift store! oh look *fabric*!] but that current storm front should clear out later tonight up here... However, you might end up with rain tomorrow [wed]..? Hopefully it'll clear by in time for Thursday! What a great combo! I can't wait to see how they evolve as you add more embroidery.